When the present Holy Father adopted Benedict as his pontifical name it was quickly recognised as an homage to St Benedict, the Father of western monastic life and patron of Europe (though, in part, it was also a tip of the mitre in the direction of Benedict XV ‘the peacemaker’, who reigned throughout the First World War). Given his fondness for our holy founder it strikes me as worthwhile taking note of what Benedict XVI says or writes about the saint and those who follow his Rule. It seems a particularly Advent thing to do. Of interest is his address to the monks of Heiligenkreuz Abbey in Austria, a Cistercian monastery and so following a stricter interpretation of the Rule of St Benedict. He visited this abbey in 2007 during his papal visit to Austria. In his address he expresses what he sees, through the eyes both of a scholar and a pastor, as essential to the Benedictine charism. It is fruitful reading for any monastery following the Rule of St Benedict. In effect, it is the papal manifesto for Benedictine life today. It should also be seen in the light of his ongoing programme to reform and reinvigorate the liturgy of the Church. I wished to come to this place so rich in history in order to draw attention to the fundamental directive of Saint Benedict, according to whose Rule Cistercians also live. Quite simply, Benedict insisted that “nothing be put before the divine office”. This should hold true also for monks. Monks pray first and foremost not for any specific intention, but simply because God is worthy of being praised… Such prayer for its own sake, intended as pure divine service, is rightly called officium*. It is “service” par excellence, the “sacred service” of monks. * Officium, translated liturgically as “office”, is Latin for duty, obligation, service, office. 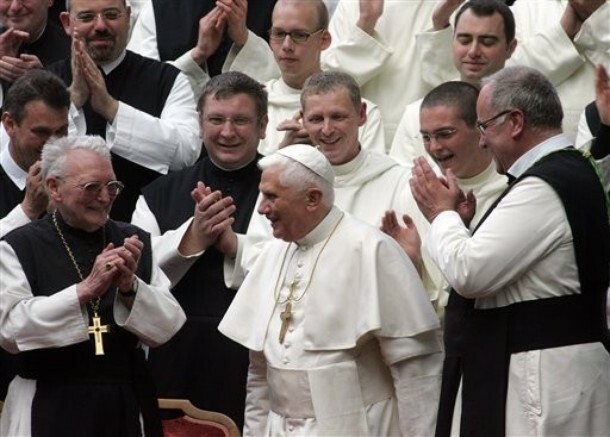 For Pope Benedict the worship of God for his own sake is definitive, a sine qua non of Benedictine life. Monks offer divine service in choir not, fundamentally, for any pragmatic goal but because God deserves our praise. In fact it is our duty to praise him, and in large measure the monastic choirs praise God on behalf of and in the name of all the Church. As a result, the monastic commitment to worship in the divine office above all other things is truly a gift to the Church, since it is “also a sacred service to men and women, a testimony offered to them”. Since it is a universal truth that all people have “a yearning for definitive fulfilment, for supreme happiness, and thus, ultimately, for God”, the fact that monks gather together to worship God at the set times throughout the day “testifies to the fact that this primordial human longing does not go unfulfilled”. Indeed our basic human longing has already been fulfilled because “God has shone forth in our darkness with his light, with his Son Jesus Christ”. Christ, in whom God has come to us so intimately that he is one of us, is the one thing necessary which will complete us as human beings: a person, not a doctrine, who is “(o)ur light, our truth, our goal, our fulfilment, our life”. In speaking of the centrality of Christ for every human being, Benedict seems to be echoing St Paul in his letter to the Romans when he says that “(o)ver and above any ability of our own to seek and to desire God, we ourselves were already sought and desired, and indeed, found and redeemed by him!”. Even before we come to the point when we can start our tentative search for God, he has already found us in Christ, and in him offers us a way to a happiness that will endure beyond this passing world. When God is faithfully praised and worshipped, his blessings are unfailing. Your primary service to this world must therefore be your prayer and the celebration of the divine office.The interior disposition of each priest, and of each consecrated person, must be that of “putting nothing before the divine office”. The beauty of this inner attitude will find expression in the beauty of the liturgy, so that wherever we join in singing, praising, exalting and worshipping God, a little bit of heaven will become present on earth. Truly it would not be presumptuous to say that, in a liturgy completely centred on God, we can see, in its rituals and chant, an image of eternity. I ask you to celebrate the sacred liturgy with your gaze fixed on God within the communion of saints, the living Church of every time and place. Our worship, as too our personal prayer, is always focused on God yet conscious of the Church universal, both living in this world and living in the next. Worship and prayer take us out of the narrow confines of our own little personal worlds, enlarge our perspective on life and so rescue us from a crippling self-centredness. … not mere strongholds of culture and tradition, or even simple business enterprises. Structure, organization and finances are necessary in the Church too, but they are not what is essential. A monastery is above all this: a place of spiritual power. In this address to the Cistercians of Heiligenkreuz Pope Benedict tells all followers of the Rule of St Benedict what he expects of them today, and indeed what the Church and the world need from them today. We might reasonably suspect that there is more than one monastery that is more focused on its own agenda rather than the one St Benedict, confirmed by Pope and Church, proposes for it. If it is unfaithful to its essential purpose it will eventually die, perhaps not physically, but certainly spiritually, a whitened sepulchre. The Pope has also posed a question for each individual Benedictine: to what extent does he (or she) embody this principle of preferring nothing to the worship of God? It is more than a question of how regular a monk is in attending the office, of physical presence in the church or oratory. It is also a matter of the attitude with which a monk attends office. Is his heart in tune with his lips? Is he attentive to what he is doing, both in mind and in body? Does he seek in worship the glory of God and so hope to merit the vision of God’s glory? Needless to say, the Pope’s words raise fundamental questions for every Christian about commitment to prayer and to worship. How often do I pray? How often do I go to Mass? And when I pray or attend Mass, is it from a grudging sense of duty, or because I desire to find in prayer and worship what they truly offer: the pearl of great price, the one thing necessary? I am an oblate novice of St. Benedict. Though barely a beginner, it seems to me that oblates, embracing the responsibility to pray the Divine Office according to our station in life, can benefit from the Pope’s emphasis as much as the monk or nun in the monastery. I must most often pray the Divine Office alone, though very aware of the voices joined with me across time and place, and thank you also for your “yes” to your vocation! You’ve done me a great service by posting this today. I would have liked to include something on the laity’s use of the office, but I feared my post was already too long! My focus was deliberately narrow, however – on the way monasteries live out their charism today. However since the Pope has made it clear that the Church needs the witness of the divine office, which is the Church at prayer, it is a logical step forward to say that everyone who prays the office is taking part in this great mission of the Church to pray without ceasing. So please do keep it up! Blessings for your upcoming oblation.